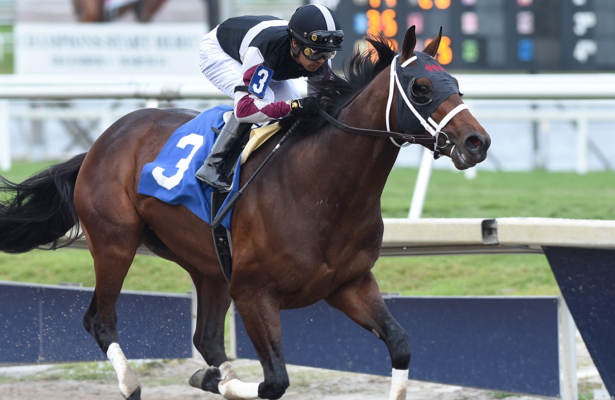 Well Defined earned the 2019 Kentucky Derby qualifying points available Saturday by winning Tampa Bay Downs’ Sam F. Davis Stakes (G3). Elsewhere in Florida, however, Global Campaign captured the buzz of the Triple Crown trail. In his second career start, the son of Curlin backed up an impressive debut by drawing off to beat Grade 1-placed Standard Deviation in a first level allowance race at Gulfstream Park. Afterward, trainer Stanley Hough said wheeling back in the March 2 Fountain of Youth (G2) “is a possibility.” Hunter Rankin, president of owner Sagamore Farm, also mentioned the March 9 Tampa Bay Derby (G3) or Gotham Stakes (G3) as potential targets. Global Campaign galloped to 1 1/16 miles in a final time of 1:44.29 under jockey Luis Saez. He broke on top, allowed Blue Steel to rush to the lead to his outside, then took control for good as they bent into the far turn. Saez had his mount geared down for a 2 1/4-length score across the wire. Global Campaign is out of the A.P. Indy mare Globe Trot, making him a half-brother to the recently retired Bolt d’Oro — and he’s doing the family proud. Saturday’s win followed an easy-as-could-be victory Jan. 5 going 7/8 of a mile first out. Between starts, Global Campaign did miss breezes due to a foot problem before returning to the work tab last Sunday with a bullet five furlongs in 1:00.40 at the Palm Meadows Training Center.